Daily Messes: Have Your Cider And Eat The Cup Too! 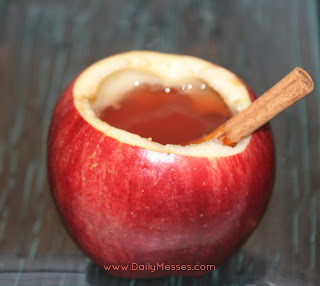 Have Your Cider And Eat The Cup Too! These are a super cute way to serve juice and a snack in the same container! 2. 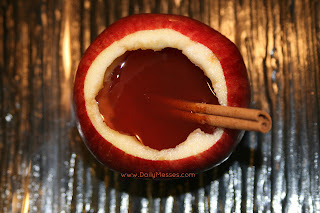 Use the melon baller and scoop out the insides. Leave a wall about an 1/8" thick. in a bowl of lemon juice water. 4. Stick in a cinnamon stick. Serve and enjoy! You can use apple juice instead of apple cider. I didn't want to waste money on seltzer water when we wouldn't use it again, so I used a sparkling cranberry juice. For younger kids, use a straw! Very cute! I am so into anything Fall right now! Great idea! Thanks! I'm in the Midwest also (although I'm from New England). I also recently posted about going apple picking! My favorite thing to do on a snowy day is to sit by the fire with some hot apple cider (although I admit that I add Grand Marnier to mine). 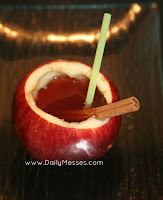 Can't wait to try it in a apple "cup", thanks for the great idea!